Takeaway: Corrosion of reinforcing steel in concrete is a worldwide problem that causes a range of economic, aesthetic and utilization issues. However, if corrosion effects are considered in the design phase and the right decisions are made prior to construction, public-use buildings such as hotels can be built to last and protected against corrosion for as long as possible. 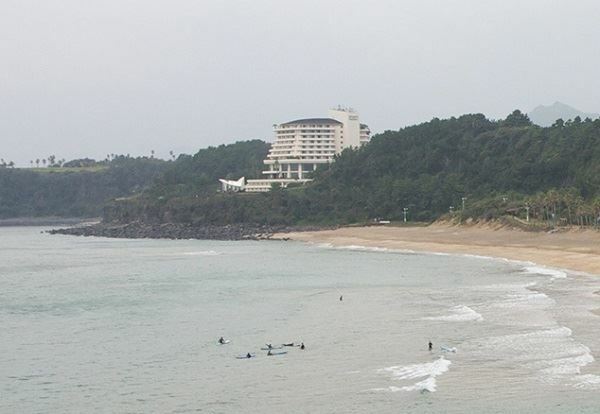 Concrete corrosion can occur rapidly at tropical resorts in marine environments. In new concrete, alkaline (high pH) conditions form a passive film on the surface of the steel rebar rods, thus preventing or minimizing corrosion initially. But eventually, a pH reduction caused by carbonation or by ingress of chloride (salt) causes the passive film to degrade, allowing the reinforcement to corrode in the presence of oxygen and moisture. When this occurs, a voltage differential of approximately 0.5 V is set up between the corroding (anodic) sites and the passive (cathodic) sites, resulting in a corrosion cell where electrons move through the steel from anode to cathode. The rate of the reaction is largely determined by the resistance or resistivity of the concrete. Acid forms at the anodic (corroding) site, which reduces the pH and promotes corrosion of the steel. 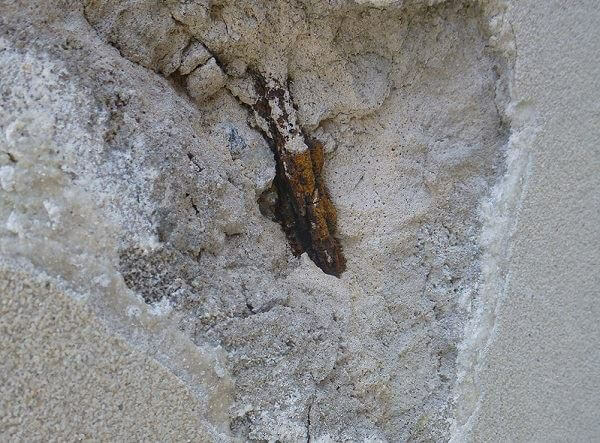 Spalled concrete on a hotel wall exposes corroded reinforcing rods. According to Infracorr Consulting PL managing director Ian Godson, it may take up to 15 years before any cracking is visible. “It is a hidden problem which means that when you find it, it is often well advanced, very much like the tip of the iceberg,” Godson said. Carbonation is the result of CO2 dissolving in the concrete pore fluid and reacting with calcium from calcium hydroxide and calcium silicate hydrate to form calcite (CaCO3). Within a relatively short space of time, the surface of fresh concrete will have reacted with CO2 from the air. Gradually, the process penetrates deeper into the concrete and after a year it may reach a depth of 1 mm for dense concrete of low permeability, or up to 5 mm for more porous and permeable concrete, depending on the water-to-cement ratio. Chlorides, usually from seaside splash or wind, migrate into the porous concrete over time, causing corrosion when the concentration of chlorides reaches critical levels at the reinforcement. In addition, older structures may have used calcium chloride as a concrete “set accelerator” at the time of construction, resulting in serious corrosion issues. The traditional concrete repair method is to remove the cracked and spalled concrete to a depth of 20 - 30 mm behind the reinforcing bars to fully expose the rusted material and remove the contaminated concrete from the steel. All of the corroded material is then removed and the steel treated or replaced. After this is done, specialist repair concrete mortars are applied and the surface made good. A modern development is for the repair mortars to be polymer modified to improve adhesion and resist further ingress of contaminants. Coatings are commonly used in combination with patch repairs to reduce future entry of carbonation or chlorides. Elastomeric polymer membrane applied to the roof of a city high-rise building mitigates the effects of atmospheric exposure. Protective elastomeric waterproofing membranes can be either rolled or sprayed onto a concrete surface. 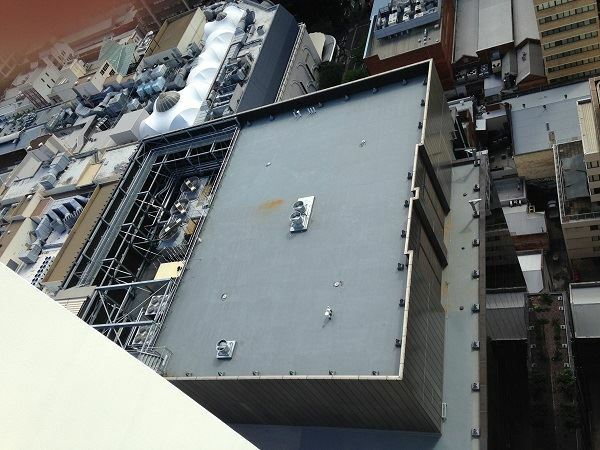 Flat rooftops allow membranes to be rolled on, but where there are complex geometries, spraying is the most effective application method. The main alternative to patch repair is cathodic protection. 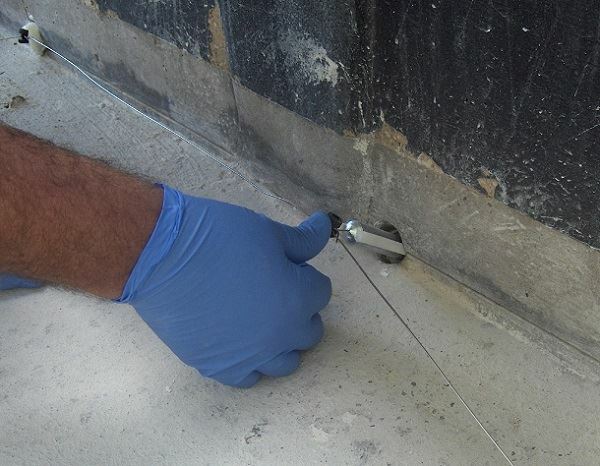 One type, impressed current cathodic protection (ICCP), is a technique where a small permanent current is passed through the concrete to the reinforcement in order to virtually stop steel corrosion. The main benefit of ICCP is that the removal and repair of concrete is vastly reduced, with only the spalled and delaminated concrete requiring repairs. (Learn more about Why Concrete Delamination Occurs and What to Do About It.) Once installed, corrosion can be controlled for the long term, eliminating future spalling and deterioration even in severe chloride or carbonation contaminated concrete. A fairly recent development has been hybrid cathodic protection, which uses zinc anodes installed in drilled holes. The anodes are powered for an initial period of around ten days. The initial high CP current totally passivates the steel reinforcement by migrating chloride away from the bars and restoring an alkaline (high pH) environment in the concrete. Hybrid anode installation with anodes installed in 30 mm diameter holes are typically spaced at approximately 400 mm with titanium connector wires. Repair mortar then completely covers the hybrid system components. Following the initial impressed current phase, the temporary power supply and cables are removed and the anodes are then connected to the reinforcement via locally placed junction boxes to provide ongoing galvanic protection. This relatively low galvanic current maintains the ongoing passive condition at the reinforcement and prevents further concrete damage. Hybrid CP systems are usually designed for a 30-year or longer design life. Hybrid CP offers all the advantages of ICCP, including corrosion control and less concrete removal, without the high cost and maintenance of power supplies, cables and control systems. Areas and structures that were previously difficult and uneconomical to treat with ICCP can be protected using hybrid CP technology. This includes small scale and remote structures situated in non-powered sites such as bridges and culverts. For buildings, hybrid CP offers significant advantages over ICCP by eliminating the need for unsightly and costly cabling and power supplies. In conclusion, it is important for owners of high-value assets such as hotels to consider the cost implications of ignoring the effects of corrosion on concrete buildings and structures. There are many advantages of planning during the design phase for corrosion control and mitigation. Two key benefits of proper corrosion management are that the life of an asset is extended and maintenance time and costs are reduced. In addition, lower maintenance increases an asset’s overall utilization and can improve its environmental sustainability. Wesley Fawaz is the Executive Officer of the Australasian Corrosion Association (ACA), responsible for implementation of the strategic direction of the organization, as well as management of daily operations. As an association management professional, Fawaz provides support and advice to the ACA Board of Directors, fostering strong links between the Association, its members and industry to help ensure all groups work together in minimizing the impact of corrosion on the wider community.